Photos donated by Jim Worden. 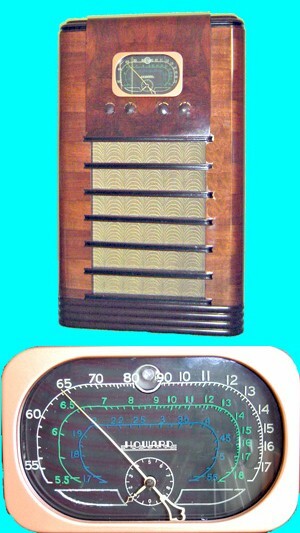 Visit Jim's web site at http://www.jimsradios.com/. This is a 12 tube "all wave" (3 band) superheterodyne console with a "rainbow" dial, push-pull beam power output, bass boost, copper plated chassis and tuning eye. The 400 was also available with pushbutton electric tuning (model 400-A). The dial includes a logging function (small dial with a geared pointer) sometimes referred to as a "band spread" that allows for pinpoint tuning between the calibrations on the dial, desirable for short wave tuning. See history of the Howard Company at Jim's web site.